Over the past few years the food scene has exploded in Detroit. There are a ton of great restaurants, bars, distilleries and breweries throughout the city, and there seems to be new additions every week. 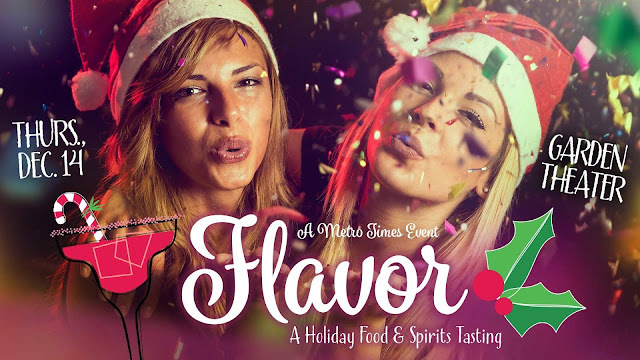 Coming up on Thursday, December 14th, Metro Times is bringing some of those great companies together for Metro Times Flavor - A Holiday Food & Spirits Tasting. This event will feature gourmet bites from Detroit area restaurants paired with winter themed cocktails sourced from local, regional, and worldwide distilleries. So you will be able to try spirits made right here in Detroit, but still have the option to sip on some of your favorite big name beverages. Some of the restaurants participating in the event include Rock City Eatery, Om Cafe, and Jim Brady’s. New restaurants are being announced every day. You can stay in the loop on those announcements here. MT Flavor will take place at The Garden Theater on Woodward in Detroit. The event is set to start at 7 p.m. on December 14th and it goes until 10 p.m. Tickets for the tasting are $25 for early birds and can be purchased here. Once the party gets closer, the price will increase to $35 and then tickets will be $45 at the door. Thanks to our friends at Metro Times, our readers can get a special deal on tickets. You can get 2 tickets to this event for only $30! That’s quite the steal! Just enter HIPINDETROIT at checkout to get this super awesome deal. The ticket price will get you admission to the event, unlimited food tastings, 10 drink tickets and there will even be a DJ! We’re sure this will be a super fun event full of tasty treats and drinks! For more info on MT Flavor and to buy your tickets, click here. Make sure you also RSVP to the Facebook event here so you can stay up to date on all of the companies that will be at the party. See you there!